Perhaps you remember this post from January that described the blessing that we received from Light for the Lost: funds that helped defray the cost of the District of Yucatan’s literature needs as they seek to spread the gospel in outreaches throughout the state. Well, that blessing has proved to be a gift that keeps on giving, because the monies that it has freed up have been put to use in the purchase of land to build churches in pivotal communities, especially those that lack an evangelical presence. It just so happens that one of those communities that is benefiting from these funds is Sierra Papacal. 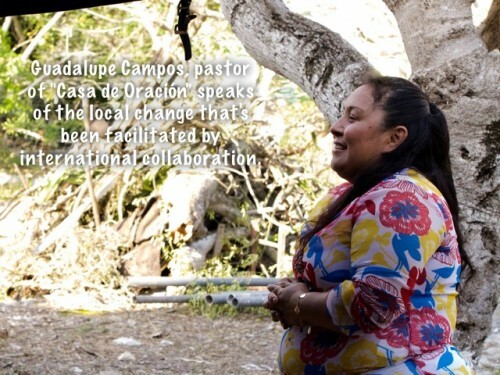 Now, if you’ve been following our reports, both in our newsletters and on this site, you’ll know that Sierra Papacal has had a church there since 2013, a church begun by my former student, Guadalupe Campos. Nevertheless, up until the end of 2015, they had been meeting in rented facilities, facilities that they were no longer able to lease. On December 31st, they were facing the decision of moving to a house church format, a blow to the sense of permanence that they had been trying to establish in the community. What a joy it was to them to receive the news that the district evangelism department, the same that had received those Light for the Lost funds, had chosen to collaborate with them to purchase a permanent home for the church right on the town’s main road! This investment in the future of the church, “Casa de Oración” has created a ripple effect throughout the congregation. Not only have they been able to secure property large enough for the initial construction and future expansion, they’ve seen various church members motivated to give toward the building that will serve as the home of their community of faith. Guadalupe has received an abundance of materials: cement sand and gravel for the foundation, blocks for the walls, and beams for the roof. In fact, they’ve received so much from this outpouring of support that they are ready to begin construction immediately! But there is even more reason to rejoice as we see how this international collaboration is bringing hope and positive change to local communities. In Sierra Papcal and in other locations there is new access to the saving message of the gospel. This is just one of the ways that we are seeing the vision of the Yucatan full of churches becoming a reality.